Endless runner reaches big milestone. We played Kiloo's Subway Surfers almost a year ago and found it to be a fairly entertaining runner. Although it fell out of our rotation (so many games), we watched it closely, paying attention to its remarkably high position on the App Store and Google Play charts. Now comes word that the game has been downloaded over 175 million times. Not only that, but it's been played 5.5 billion times. Those numbers landed it within the top 50 highest grossing iOS titles list for nine consecutive months. "A lot of big mobile developers are losing focus and trying to do silly things like build amusement parks," said Jacob Moller, CEO and founder of Kiloo. "Instead, we focus on making great mobile games that keep users interested for astonishing lengths of time." That's clearly a shot at Rovio and its Angry Birds theme parks. 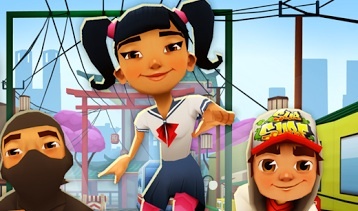 Not sure if it's warranted, but regardless, we applaud Kiloo for its success with Subway Surfers, and look forward to seeing what the publisher plans to release next.